Chinese numerology is a fascinating thing, with a deep history and some intriguing superstitions that continue to thrive in the modern world. 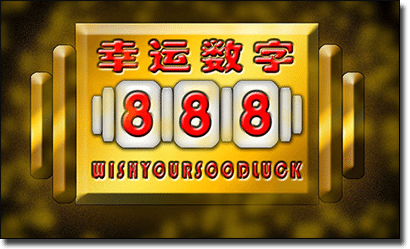 It’s not just the Chinese who stay true to their beliefs about what constitutes a lucky number, many Westerners have also started to take heed of the ancient wisdom surrounding Chinese numerology, with many people around the world using Chinese lucky numbers when making their lotto picks. Read on to find out how lucky numbers are determined in China and why you may want to consider choosing one of these prosperous digits the next time you’re choosing your lottery numbers. What makes a certain number deemed lucky in Chinese culture? Whether or not a number is deemed lucky or unlucky in China is based on whether the pronunciation of that number sounds similar to a good or bad Chinese word. Auspicious numbers are considered to be lucky because their names sound similar to words that are associated with fortune or positivity. This superstition first came out of ancient Cantonese culture but is now followed by many other Chinese and Japanese dialects. There are other reasons a number may be considered lucky, like its link to an ancient Chinese proverb or relevance in a historical context. Even numbers are generally considered luckier than odd numbers, although many odd numbers are among the luckiest numbers of all. Three – the number three sounds similar to the Chinese word for birth, which is considered to be very auspicious in China and also signifies one of the three most significant events of a person’s life – birth, marriage and death. The Chinese believe that a group of three people is luckier than a pair, based on an ancient proverb that says “the wisdom of three ordinary people exceeds that of the wisest individual” and Confucius’s belief that “three people are walking together; at least one of them is good enough to be my teacher.” The number three is deemed so lucky that in 2004 a man from Beijing paid a huge $215,000 for the lucky phone number 133-3333-3333. Five – ancient Chinese philosophy believes that the existence of the whole world is only possible due to the presence of five elements; earth, wind, water, metal and wood, and the mutual effects that each of these elements has on the other. Due to the strong beliefs set around the mutual effects of the five main elements, the number five is often used to classify other things with similar characteristics, for example the Chinese consider there to be five elements of taste; sour, sweet, bitter, salty and pungent. There are also five sacred mountains in China and there were five Chinese emperors. Six – the number six is similar in sound to the Cantonese word meaning wealth and is often favoured by Chinese gamblers in the hope it will bring fortune their way. It’s similar pronunciation in Mandarin to a word meaning ‘flow’ or ‘smooth’ makes the number six especially lucky in regards to business transactions. Six is considered to signify that everything is going smoothly. Seven – seven is one of the only lucky numbers that is considered lucky in both Chinese and Western culture. In Cantonese, the number seven is homophonous with a word meaning ‘togetherness’ and therefore seven is deemed especially lucky when it comes to love and relationships. In traditional Chinese culture seven is used to signify the balance between the five elements (earth, wind, water, metal and wood) and yin and yang, resulting in the perfect balance of harmony. In the Chinese Tao, seven is also used a symbol for kindness and beauty. Eight – the number eight is considered to be the luckiest number of all and is highly revered in Chinese culture for many reasons. It’s deemed to be so lucky that it’s often added to other numbers in hope to bring even further luck (for example, 18, 28, 38, 80, etc). It’s near identical sound for the Chinese word for wealth and prosperity makes it particularly auspicious, while the physical appearance of the figure eight is the same as the mathematical symbol for eternity. Testament to how highly valued the number eight is to Chinese culture is the Beijing Olympics commenced at exactly 8:08 on the eight day of the eight month in 2008. In 2003 Sichuan Airlines purchased a phone number consisting only of eight’s for over $280,000 USD. Nine – nine is homophonous for the Chinese word meaning “long lasting” and often features prominently in matters of the heart like weddings. On Valentine’s Day it’s common for a man to give his lover 9 or 99 roses as a sign of his eternal love. It also has roots in ancient China, where many Chinese Emperors favoured the number nine, where officials were ranked using the nine-rank system and Emperor’s robes often featured nine dragons. Want to know more about superstitions surrounding lucky lottery numbers? Click here to read our article about common superstitions people believe in when it comes to picking their lotto numbers.